We love to design and create the future for long term success creating positive impact. Through no ordinary approach and tools we help you to change the actual situation and design your future, creating strategy, solutions and new business models driven by innovation transforming your thinking. In times of change and uncertainty, volatility and complexity the traditional approach to to strategy seems not be able to achieve a permanent and solid growth. We help you to through Strategy Design approach to develop ideas and revolutionize problem solving with your customer firmly at the centre. Strategy Design method allow to build empathy, extract insights and create new solutions, helping organization to be more effective and creative. Innovation drives you to re-think strategies, markets, competitors and business model. We help you to develop innovation capabilities to create a new vision, to start diverse thinking, unlocking potential. At FORTYTWO we work with you to create a culture of innovation, bringing various groups together to develop solutions, sharing ideas and design the future testing breakthrough innovations. Design has to be considered the new competitive advantage. Companies need to be different and innovate, to do it they must have the ability to create an innovation culture led through design. Design helps to solve complex problem and through design thinking and future thinking to disrupt and not be disrupted. We utilize the best tools to speed innovation and creative strategy. FORTYTWO is the Italian partner of the most important innovative tools for strategy, design and business modeling. We utilize tens of visual and innovative tools and methods in our workshop and dedicated company programs. THP is a unique and engaging method that, through neuromarketing and gamification helps companies to embrace a constant trasformation and an exponential growth, making decisions in a lean and efficient way. Become the protagonist of the classic hero and villain story with The Hero Plan and discover in first person how intuitive could be work on your business strategy, action plan and business model. IJ_42 is a full innovation program designed by FORTYTWO, utilising large part of our unique tools, for companies, corporates and start-ups. It consists of different phases from Idea generation to the perfect execution of the project. Innovation Training/Innovation Drivers-Ideas generation/On-boarding activities & teams recruitment/Challenges Definition/Products & Services Design/Business modelling & Validation Process/Proof of Concept/Business Planning/Execution. You can use the Ten Types to help your innovation efforts in many ways. It can be a diagnostic tool to assess how you're approaching innovation internally, it can help you analyze your competitive environment, and it can reveal gaps and potential opportunities for doing something different and upending the market. There are over 100 innovation tactics–specific, known ways you can use the Ten Types of Innovation. These are like the elements that bond together to form molecules; you can use them to construct the breakthroughs that will help you make a real impact on your industry. 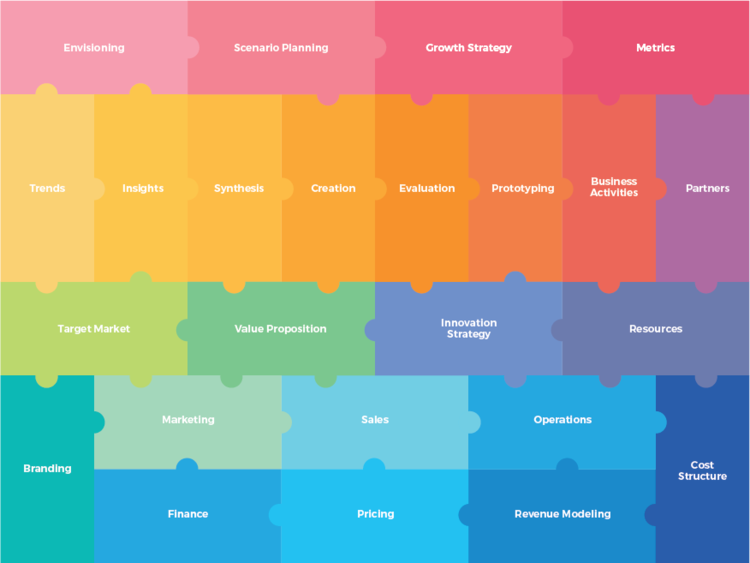 The Business Model Canvas is a strategic and entrepreneurial tool. It allows you to describe, design, challenge, invent and pivot your business model. The BMC is a global standard used by millions of people in companies of all sizes, it works in conjunction with the Value Proposition Canvas and other strategic management and execution tools and processes. The Sprint is a five-day process for answering critical business questions through design, prototyping, and testing ideas with customers. Developed at GV, it’s a “greatest hits” of business strategy, innovation, behavior science, design thinking, and more—packaged into a battle-tested process that any team can use.Working together in a sprint, you can shortcut the endless-debate cycle and compress months of time into a single week. Instead of waiting to launch a minimal product to understand if an idea is any good, you’ll get clear data from a realistic prototype. The sprint gives you a superpower: You can fast-forward into the future to see your finished product and customer reactions, before making any expensive commitments. PERSONAL POWER PLANNER is a method invented by Ugo Mendes Donelli, to help people and companies, to improve how you use your time and energy, learning by doing. Plan, act, & record. everyday. Have you ever felt pressure to perform? Did you ever ask yourself: "Where did my time go?" This planner is for you. You will learn where your time actually goes. You will learn to be better at planning. You will improve your performance. PERSONAL POWER PLANNER: learn from your day! The European Commission recognises design is a crucial factor in innovation, economic growth and competitiveness in the global market. €Design is an EC funded project to create a set of tools to measure the positive impact of design, providing evidence to encourage policymakers and businesses across Europe to integrate design into their work. “To design is [to focus on] the integration of functional, emotional, and social utilities.” This definition goes beyond the traditional economic view of design as an add-on process that takes place after technological development. It’s intended to highlight the fact that the design process is able to integrate the functional, emotional, and social needs of users. 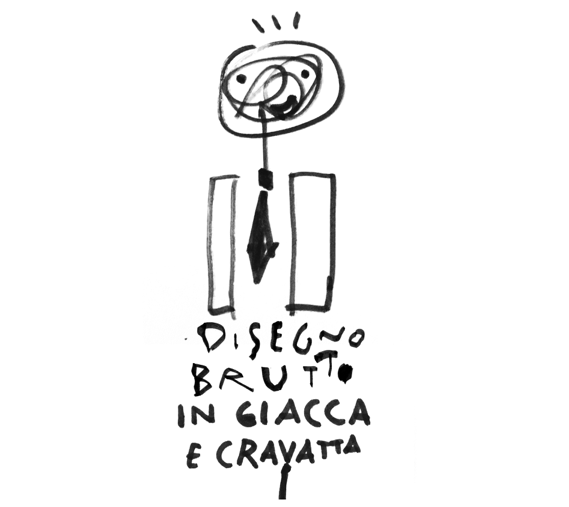 DISEGNO BRUTTO in giacca e cravatta (TERRIBLE DRAWING in the office) is the business version of DISEGNO BRUTTO created expressly for FORTYTWO, a new way to learn how to use design as a tool for creativity, communication and innovation. DISEGNO BRUTTO helps you develop your ideas by drawing badly and finding new points of view. It forces the observer's mind to add the missing parts of the design to interpret the traits and is therefore more engaging and immersive. DISEGNO BRUTTO in giacca e cravatta (TERRIBLE DRAWING in the office) is the most powerful visual thinking method and it is available for company workshops or dedicated programs. MethodKit is an open-ended tool that can be used in many different situations and workshop settings, to structure thoughts, understand each other and collaborate more easily. A 8 steps process: understand, prioritise, map, communicate, brainstorm, structure, document and include, to speed collaboration and develop projects.